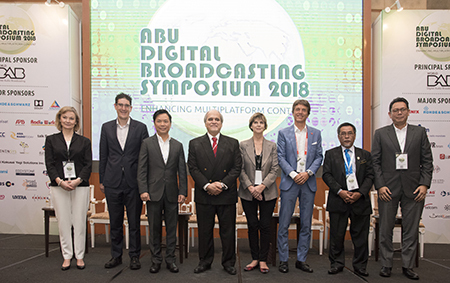 Today saw the official opening of the DBS symposium in Kuala Lumpur, the theme for which is “Enhancing Multiplatform Content”, focusing on the importance for broadcasters to embrace the new changes impacting the industry. In his opening speech, Dr Mottaghi expressed one of the aims of the symposium is to address the technologies and techniques essential in developing appropriate and engaging content which can target the changing behaviour and demands of audiences. He impressed upon the audience that the momentum of change in the broadcast industry is ever-accelerating. New technologies and services are emerging in rapid succession and it is imperative for broadcasters to evaluate how these technologies can assist them, and how they can capitalise on the opportunities they provide. He stated it is crucial that broadcasters keep enhancing their services to audiences to remain relevant and competitive in this industry. Dr Mottaghi said that organising this event would not have been possible without the generous support of the 60 plus sponsors, exhibitors and partners. He thanked the principal sponsor, the WorldDAB and other major sponsors. He also thanked Radio Television Malaysia-RTM for their continuous support of the event. With recognition and appreciation having been expressed, he declared the symposium officially opened. Participants attending the event from 45 countries, representing over 250 organisations are in the city attending workshops, visiting industry exhibitor booths, greeting colleagues and networking amongst industry players.